This college is alienating students and rewarding the other students for their opinions. Why is this faculty pushing their agenda on these students? The University of Pittsburgh’s School of Social Work encouraged its professors to offer students extra credit to participate in an anti-Trump rally in downtown Pittsburgh. On Thursday, students and faculty in Pitt’s School of Social Work received an email urging them to sign up for “A People’s Agenda for Change: National Day of Action” on Tuesday, November 29. The email, which Student Services Specialist and assistant to the Associate Dean for Academic Affairs Mary Patricia Elhattab sent, implored professors to give their students extra credit should they attend. Lindsey Hern, a senior Social Work major, said that she receives a lot of similar, “one-sided” emails, and that she regularly feels alienated as one of the only conservatives in the department. “It’s really ostracizing when your own department sanctions an event that is so exclusive to one set of students,” Hern told The Pitt Maverick. The email also included information about free transportation from Pitt’s campus to downtown Pittsburgh for the rally. 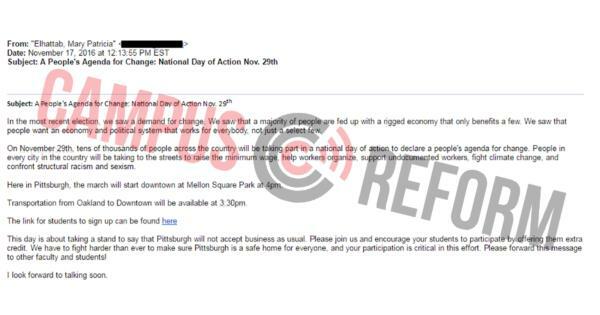 According to the email, the march is about “taking a stand to say that Pittsburgh will not accept business as usual” as well as challenging the “rigged economy.” The email included a link to the sign-up page for the rally. “People in every city in the country will be taking to the streets to raise the minimum wage, help workers organize, support undocumented workers, fight climate change, and confront structural racism and sexism,” the email reads. Pitt’s campus is among the hundreds of other campuses to protest against Trump after his election victory, and at least three students were arrested Thursday after a fight between protesters and campus police broke out in the Litchfield Towers Lobby on Pitt’s campus. In that instance, police uses batons and knee strikes to subdue the unruly, according to The Post-Gazette.